I store mine on a shelf / rack which I made myself from left over plasterboard, glue gun and some acrylic paint. I have one large unit and a smaller one as a 'over flow' I choose to store mine like this rather than in a draw / helmer because if I can't see them I know I would forget what I have and wouldn't use all of them. I have them in colour order rather than by brand as this again helps me see and compare what I have. Say I want to use a light blue, I'd look for the blue section then the light blues and then compare a couple to see which one I want to use. 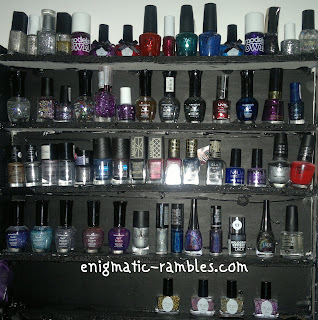 If you want to see swatches of any of the polishes I have then you can always click the stash tab above, or here. 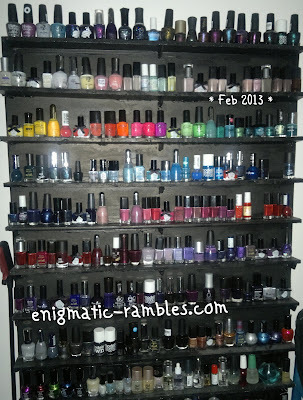 I'm still deep in the process of organising my polishes. It would be easier if I stopped buying more! That rack is briliant! Fair play to you for doing that yourself, like the commenter above I'd be afraid it'd fall apart if I did it!